Nothing to see here, non-University of Chicago people! This is a special post just for the UC scavenger hunt, so these are NOT the Wrecks you're looking for. Move along, move along. "The University of Chicago Scavenger Hunt was founded in 1986 by (yep, you guessed it) a bunch of nerds from the University of Chicago. Over time, it has grown to become what many consider to be the world's largest scavenger hunt, with items ranging from homemade nuclear reactors, to elephants, to the one you're about to see right here. A cabal of University of Chicago student judges write all Scav Hunt items and awards points to final submissions, keeping the list secret until the beginning of the Hunt, and teams race to beg, borrow, steal, and do as many of the 250+ items on each year's list over a four day timespan." 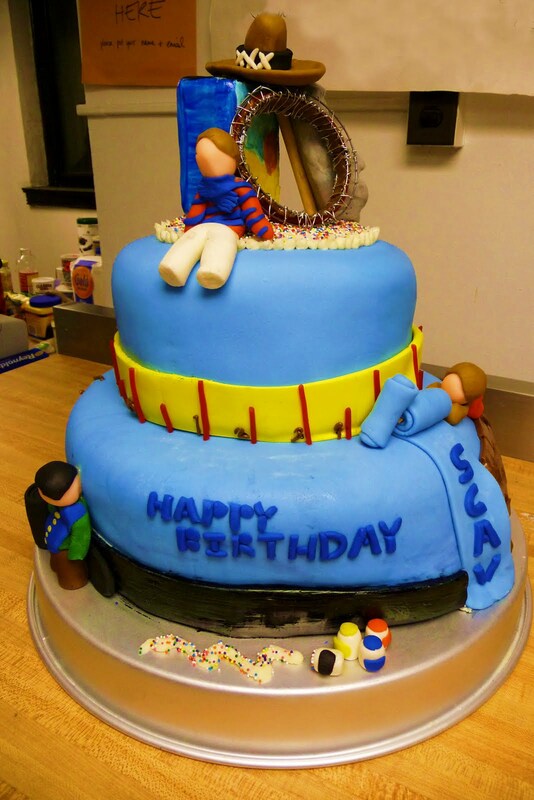 "It’s Scav Inger Hunt's 23rd birthday, and 99.9% of mohawked baby carrot judges agree: I WANT SPRINKLES. Craft a thoughtfully artistic, yet still scavvly commemorative cake, and it better be purdy enough to be featured as a Cakewrecks Scavday Sweet. Under Neat That: submit your Wreck by Friday at 10 pm, and we’ll let Jen pick the one destined for internet fame." In Sonia's words: "We tried." Christine tells me they were going for cute, "but I think something might have gone wrong." Ah, classic Wreck elements. I like it. Yep, I'd say we have a winner! Best of luck to all the teams who participated. Hee hee. I don't know what this is about, but we shouldn't let these people loose in a bakery. God forbid they get a hold of the pro's tools, like airbrushes and plastic flotsam. :) Great efforts, the lot of 'em!!! I like that you called the the last one a ferby, though it's probably Totoro from the anime My Neighbor Totoro. 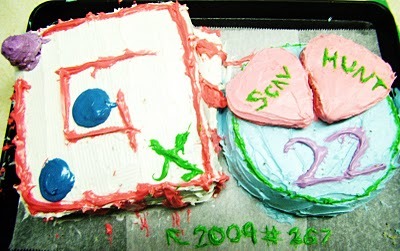 That Edward/MJ cake should have won. 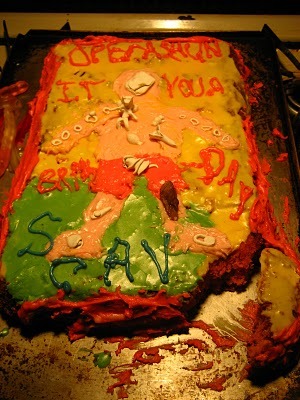 I haven't laughed that much at a cake since that UK logo tiger thingy. VW: Sidet. Sidet cake der? It's wrecktastic. May 8, 2010 | R.
For all of the times we've not done homework to read this blog- WORTH IT x 25 points! These are all absolutely Wrecktacular! But I agree that the final pic is the Winner Hands Down. I guess this means that you're an official celeb, Jen. Great job to all the participants and big congrats to you for the honor. This has got to be one of THE funniest things I've seen in a long, long time! Thank you to my pal Susan for turning me on to this. I laughed so hard, I nearly cried! For all the times we read this blog instead of doing homework- WORTH IT x 25 points! Do we get to vote for which one should win? Because if we do, I say it's "My Little Pony" by a length. Yay my sister's team won! She described it over the phone and it definitely do justice to just how wrecky it is. I am stunned! Although, I have to say that the whole scavenger hunt idea is a very creative and relatively harmless idea for "dead week" activities.Unlike when I was at Rice and some people would etch "things" on rival dorm buildings with dorm room made lasers. I have to agree that the CCC won the competition. Lol you just made my day! I showed her the "Furby" cake and said "hey look it's a cake of Owl." She looked at it raised a sceptical eyebrow and said, "Uhhh no." 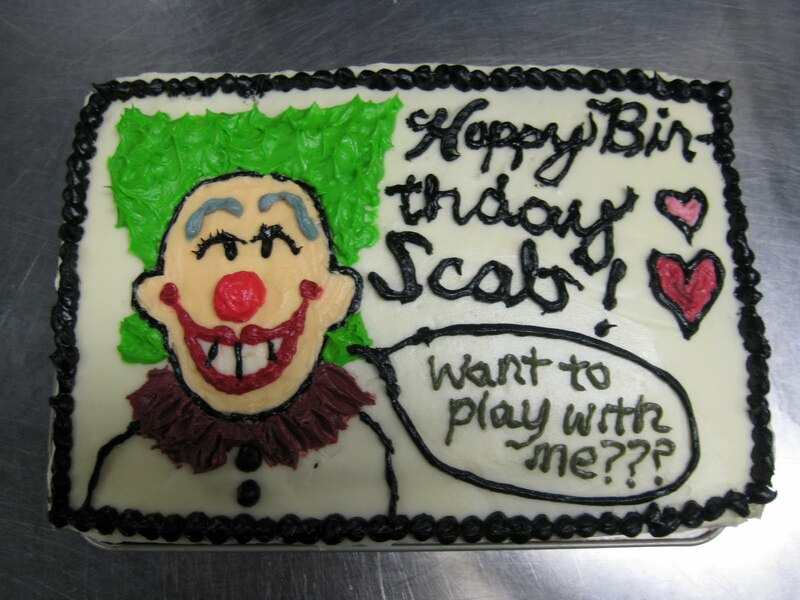 That first cake, while sloppy and ambiguous, looks darn tasty. I think I want to go to the University of Chicago. Awesome. How fun to be included in the tradition. Love the wrecks! Haha, that winning team definitely did their research. Just thought you'd like to know, that is NOT a "furby". It is a Totoro. From My Neighbor Totoro. That last CCC looks like Totoro to me. 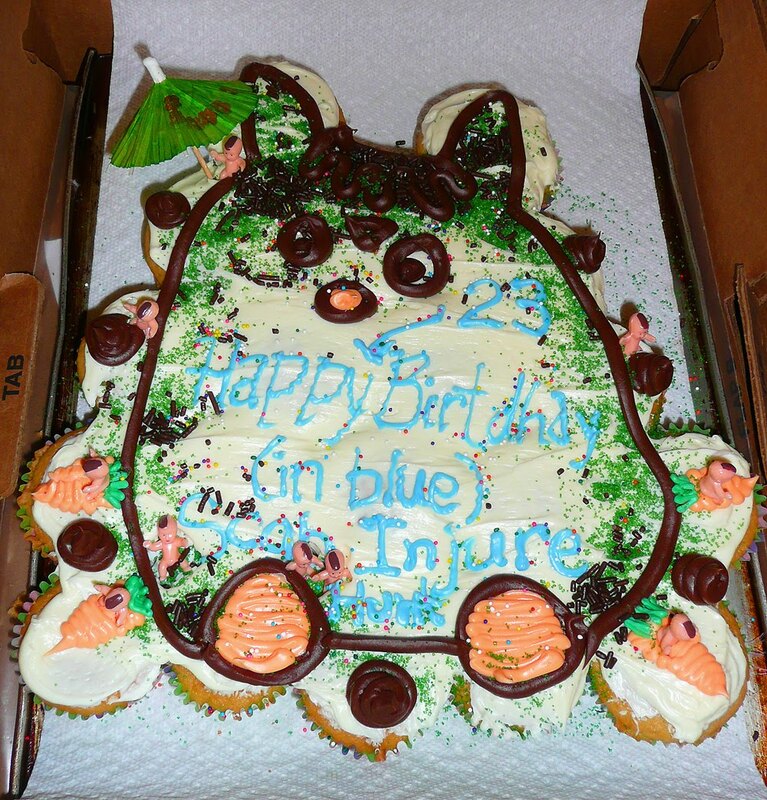 The last cake isn't a furby, it's Totoro! That cake totally made my day. May 8, 2010 | Holly K.
One question though, why is there a llama on the Scab Hurt MacPierce cake? Is that the llama's name? Definitely the "My Little Pony" was IMHO, the best (?) 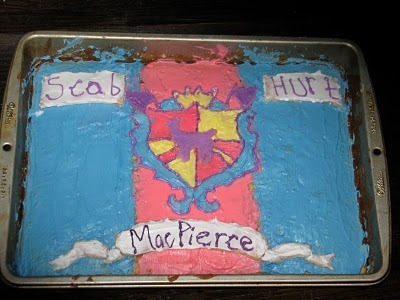 the only one that made me laugh out lound when I saw it..but guess your choice had more classic Wreck elements...still, I believe that pony cake is the most gawd-awful excuse for a cake I 've ever seen-and I love it! have you ever seen "My Neighbor Totoro"? I believe that is what the winning cake might be...japanese wood spirit, a "totoro"..
anyway, yes, def. the best one! The "Furby" CCC looks more like Totoro. Can you say "Epcot"? I want a Totoro cake!!! I have but one thing to say about the Furby vs Totoro controversy... EPCOT!! And they used to have a Mike Royko item every year. Now that he's dead... they should still have it! "U of C will teach you think, teach you to drink. Social skills... you're on your own." That's officially deemed the winner in my book too. Scab Hurt? that sounds like something a two year old would say after they had picked off their scab!!!!! I can confirm that it is indeed supposed to resemble a Furby and not Totoro. The Wreckerators had no knowledge of what Totoro is prior to creating the wreck. I've got to throw in another 2 cents that the Furby CCC is probably a Totoro CCC. I sumbit as evidence 2:47 minutes of magic that is Totoro discovering an umbrella. (I love this scene so much! :) ) Sans carrot baby jockeys. The last one is so ugly it's cute. Thanks for working on a Saturday to share these with us. 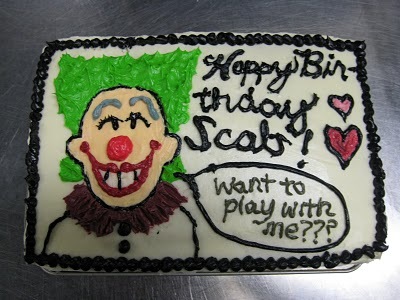 I rather like the fondant cake. Someone has talent and may make it to Sunday Sweets someday. As for the rest, their parents must be so proud that their tuition payments are being used wisely. My, but these are mon-stros-ities. As a member of the Max P team, I can assure you with confidence, it is a FURBY. But a wreck of a furby. One of our t-shirts reads, "Keep uchicago weird" on the front and has Demolition Furby destroying campus Tokyo style. LOVE LOVE LOVE the cupcake cake! that is truly a wreckplica. where did they get the mohawk babies?? I thought things were urban Cakewreck legend. That is a great scavenger hunt! Love it!! I didn't know that Chicago had a scavenger hunt, but University of Waterloo's engineers do one with a list like this every year. Back when my friends and I were undergrads, I lived for the tales about their "skunt"! The llama is the MacPierce mascot. It gets incorporated into a lot of the items we build (as well as our team shirts). Also you cannot believe how excited we were to see this as one of our items :D.
I got very excited and was going to say that the last cake was Totoro...but after reading the comments and discovering it IS a Furby, I guess my happiness kind of withered away. LoL. I thought the umbrella was a dead give away. I suppose Totoro and Furby are similar, but Totoro wins in my book. ^-^ ...I'll just pretend it's Totoro. UofC alumna here. Unfortunately, I graduated before Scav Hunt started. What a treat to see a favorite website and my alma mater conjoined! The only thing that surprises me is how little research some of the teams did. They should have all had a minimum of 20-25 Cake Wrecks elements on them. to totoro or not to totoro? either way i would love to see a catbus cake. and.... go!